Update 23 consists of a few minor changes and bug fixes and the continuation of the seamless level streaming system that optimizes load times and RAM usage by only loading objects in the world when the player is in the vicinity. You can now load a save directly from the death menu instead of having to reload the starting screen menu. This should greatly shorten load times for some users when reloading a game after dying. Many more trees, boulders, buildings and resources have been added to the Snow Biome. The South Western Island has more trees and boulders on the central mountain. All but two lit campfires have been removed from the large inhabited hut at the center of the map to improve frame rate in that area. Video settings now persist from the main menu to the game world and through subsequent loads. However, settings will revert to default when shutting down and reopening Windstone. This will continue to be worked on so settings can be saved through shut downs. All loot baskets now only generate loot upon opening them. Previously the baskets all generated loot at the start of a new game which caused thousands of unnecessary items to be taking up RAM. 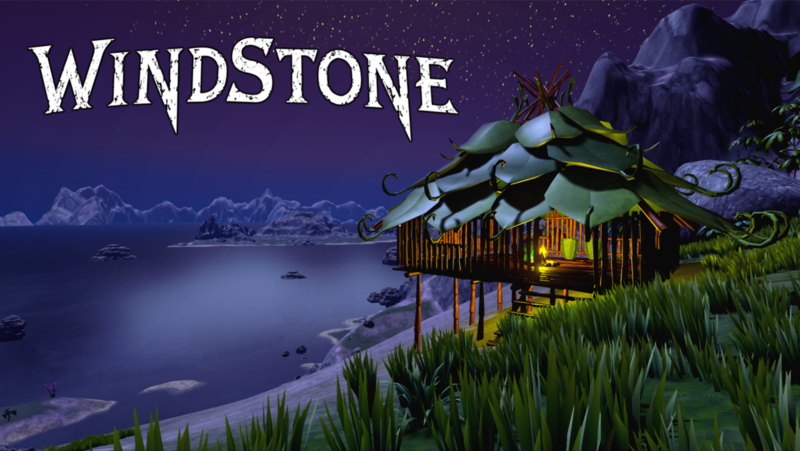 The entire world of Windstone currently consists of 35,000+ items such as all trees, boulders, plants, huts, baskets and wildlife. At any given time about 6,000 to 8,000 of these items are loaded into the game at once depending on where you are with the newly implemented seamless level streaming system. This number will be reduced to around 1,500 as more items continue to be added to the level streaming system which will continue to improve loading times and performance. Thank you for playing Windstone! Originally posted @ itch.io, which is also where you can get the game. First off I want to apologize for how long I left Windstone in a broken state. Although the game itself mostly worked well, the loading times when loading a save slot were ridiculous. This was caused by a bug that occurred when updating the Unreal Engine to a more recent version which allows more functionality and a variety of additions to the game to increase it’s quality, but with a game engine transition comes a huge headache of numerous bugs. Most bugs including the loading bug are finally fixed but there may be some other bugs that I have not yet discovered that may have cropped up during the game engine transition. The changes from the last update have mostly been re added to this version except that the custom mouse cursor has been reverted to the standard windows cursor. This however has proven to not fix a bug that I thought was caused by the custom mouse cursor. The only known issue with this update is that the mouse cursor sometimes will still disappear when clicking on certain button in the Inventory UI. You can get the mouse cursor back by left clicking your mouse. The highlighted inventory slots have also been re-implemented. They don’t work perfectly yet but this is a minor issue that doesn’t really affect game play. I will continue to work on that as I figure out how to get the mouse cursor from disappearing. A problem has also been fixed that wouldn’t allow you to start a new game in a new starting area unless you restarted the game. Windstone will now be free once again to play test until April. Thank you for playing Windstone and any and all feedback to help the game develop is much appreciated. Originally posted @ itch.io on 2019-01-20. Update 19 consists of mostly underlying work to upgrade the game engine. Windstone now uses version 4.19 of the UE4 engine. Windstone will upgrade to 4.20 and 4.21 in the future and with each subsequent update to the UE4 engine when the new versions are stable. As of now, version 4.20 and 4.21 have an issue with the Blueprint Compilation Manager that conflicts with Windstone. This engine upgrade required many things to change in Windstone’s code, most of which is not apparent to the player, but the end result and development functionality is much better. A visual and performance increase should be immediately noticeable. The custom mouse cursor now looks like a stone arrow head again instead of the standard windows arrow. The custom mouse cursor also now appears at the same spot at the center of the screen when menus are activated. An issue is fixed that caused the leg armour animation to become out of sync with the leg animation while walking. A counter measure has been added to help keep from getting stuck in foundations when loading a game that was saved while standing in a building. A better fix is being worked on but this will be determined by how the new level streaming/loading system evolves as it is still a work in progress. Button highlights in the inventory have been disabled. Upgrading the engine caused them to bug out entirely and much of the inventory drag-and-drop programming had to be changed. For now, the highlights are deemed unnecessary but may be implemented again in the future. The Details pop-up Widget when mousing over an inventory item now shows after .5 seconds in both the inventory and storage. The position of the pop-up relative to the mouse cursor has also been changed slightly due to the custom cursor. A user setting may be added to change the time delay for the pop-up or to disable it entirely, but that’s in the bells and whistles category for much much later unless enough people want it sooner and protest. Windstone should now open in full screen by default instead of windowed mode. It now takes 3x longer for your mental fortitude to become muddled from all effects. If you die now from being muddled you better just stay indoors for the rest of your life. Some day I plan on adding difficulty levels where the muddled mechanic will be different for each one. For now, keep mushrooms on you and room in your belly to eat them at all times for emergencies and becoming muddled will never be a problem. Most mushrooms increase your mental fortitude. Warning: There are very few mushrooms in the snow biome except for what you may randomly find in storage baskets. The female proxy character has been added to the dragon. 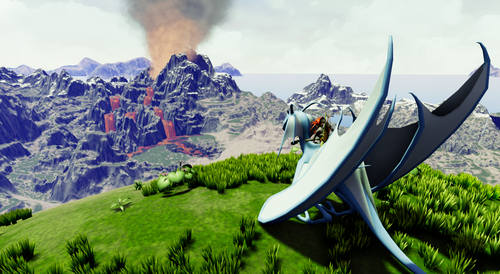 When you are mounted on a dragon (the camera switches automatically to third person) you will now see some of the weapons and armour that you have equipped that are visible on your character in the inventory menu. The default FOV (Field of View) has changed due to the engine upgrade. It is still not adjustable in options, but it is wider than it was. FOV adjustability is another for the bells and whistles of the future. Stone arrows now inflict about 2x more damage and Obsidian arrows about 3x more. Harvesting meat, carapace, hide and feathers from carcasses now will happen with every swing of the knife or hammer (the hammer is only used for carapace). Instead of the Obsidian Knife giving a higher chance of harvesting with each swing, it now allows you to harvest twice as much meat and feathers. The LOD system is completely different and may not be as optimized as it once was. This can cause some visual and performance degradation. I will be working on this more as everything is adapted to the new version of the engine. AI and navigation of wildlife has more issues, especially with the Formicans on inclines and the Ostri in general. For the most part they still seek and attack you in the same way when you are close enough to them, but you may find yourself looking at the wildlife from a distance and thinking, “wtf is that creature doing over there?” as the creature tries to figure out wtf it is doing. Some stones may not be able to be picked up that were able to be picked up before. Please let me know if you find any other item that is not able to be picked up (that you knew you could pick up before). Basically every thing should be able to be pickup up or destroyed except for the grass, the pre-existing buildings and some ground foliage. When loading a game from a save, it may hang at 40% (SaveInterfaceCall) for a few minutes. This did not happen before upgrading to 4.19. I’m working on a fix for this now as this is a huge priority. Update 19 is coming a little sooner than expected with a major version upgrade to the UE4 engine. Windstone will now be using a more recent and stable version of the UE4 Engine, Version 4.19. Version 4.20 and 4.21 have major known issues that conflict with Windstone but transitions to newer versions will happen periodically once these are fixed. Because of the many changes that needed to happen to bring Windstone to 4.19 (all the way from 4.11) it needs extensive testing before it is safe to continue with development. Although the underlying changes are massive, add much more functionality, improve performance and increase visual quality, this update will not have many changes immediately apparent to the player. There are some changes including the addition of the female character while mounted on a dragon as well as visible weapons and armour on the dragon rider that change depending on what you have equipped. A handful of other bug fixes and minor changes have also been made which will be listed in the patch notes. I hope to push Update 19 before the end of the weekend. A two-handed Stone Axe and large Stone Maul can now be crafted through the tool tab on the bushcraft menu. The primary use of these new tools are to harvest wood and stone at a much faster rate than the one-handed hatchet and hammer. The Axe and Maul are relatively easy to craft but are heavy, cannot be used as crafting tools and must be switched manually with the hatchet or hammer respectively depending on the task at hand. The Axe and Maul can also be used as weapons and are only surpassed in damage output by obsidian weapons. Tools, weapons and armour can now be dragged and dropped to quickly equip them. Drag an equippable item out of the inventory and drop it to automatically equip it to its pre-assigned slot. Double clicking an item or selecting equip from the right-click drop down menu still works to equip an item also. Custom hotbar slot orders may be added in the future but is not currently a priority. Hunger and Thirst now takes twice as long to deplete. This change has also been applied to the Dragon Hatchling allowing you more time to find food and water for yourself and your hatchling. Maximum sleeping time is now increased from 5 hours to 10 hours. Due to the increased size of the Building tab, the location of most notifications have been moved onto the top border of the inventory and contrast more with the background. This prevents the notifications from being hidden behind the crafting window and makes them more apparent overall. The sorting button [^] has been moved to the bottom border of the inventory. Some changes have been made to water surfaces and shadows to increase quality and performance. Motion Blur has been turned off due to a conflict with other post processing settings. This primarily effected the first-person arms, making them blurry with jagged edges when animated. Dragon colors should now persist through game saves/loads instead of reverting to blue/green. The Dragon Hatchling should no longer be able to be turned into a juvenile instantly after hatching. An issue was fixed with Drinking Well LODs as well as various other minor bugs. More changes to the landscape have been made and assets have been added primarily around the starting areas. This will be an ongoing process throughout many more updates as the world continues to be built and gameplay mechanics pertaining to the availability of materials are balanced. Posted @ itch.io which is also where you can get the game. This hotfix addresses an issue caused by update 15 which stopped wildlife from spawning in certain areas. This should work as intended now. When Riding a dragon, the rider’s shadow should now appear correctly on the ground. An issue has been fixed that caused the camera to spin uncontrollably when diving downwards while riding a dragon. Some trees have been slightly moved to keep their branches from clipping through buildings.